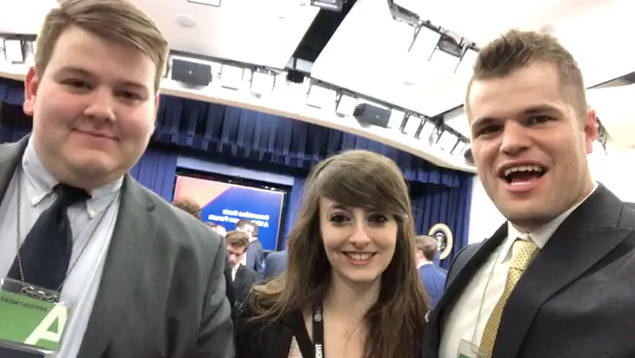 Last Thursday, two Forge graduates and I had the incredible opportunity to attend a special exclusive White House Millennial Forum called “Generation Next.” Around 150 millennial leaders from across the country were invited to take part in the leadership forum and ask questions of President Trump, advisors like Kellyanne Conway and Ivanka Trump, and cabinet members like the Secretary of Labor and Secretary of Health and Human Services. We were very humbled and honored to be invited to an event at the White House and connect with officials serving in the administration like our friend Paul Teller (conservative liaison in Legislative Affairs) and other young conservative leaders like friends from Heritage Foundation, Americans For Prosperity, Alliance Defending Freedom, Leadership Institute, and more. Forge grad Boaz Akins, who ran very successful phone banks in the 2016 general election, was in attendance, and Forge grad Rachel Del Guidice was also there covering the event as media for The Daily Signal. It was wonderful to catch up with them and share the experience together with young leaders who Forge has trained, mentored, and helped propel to already great things at very young ages. The White House posted an article and picture of the event here. You can see me and Boaz in the audience at the very bottom of the picture, toward the left hand side. Also, as part of her coverage of the event, Rachel Del Guidice had an exclusive interview for The Daily Signal with Kyle Kashuv, the young man from the Parkland tragedy who has become well-known in the last few weeks for advocating for a different response than many of his other outspoken classmates. We’re excited for the recognition that Forge continues to pick up nationally. Whether it’s students landing incredible internships and jobs, making a name for themselves in their careers, or special accolades and honors, the country is taking notice of the results of Forge Leadership Network. (Application is Open Now to the 2018 Forge Leadership Summit; young conservatives should apply today. See below). We’re thankful for what this recognition means for more opportunities being made available for our students, for the credibility that gives Forge when a graduate comes out of the Forge Mentorship Academy with the Forge name attached, and for the new recruits that will hear about and attend the Forge Leadership Summit as a result of this increased exposure! Thank you for your support and partnership in this ministry! Early-Bird Price Discount ends on April 15th!